I was very pleased with how the brown frock turned out for my UK client, but out of the two I’ve done the blue one for my US client is my personal favourite. It's been challenging to make, as the brown grid pattern demands that it is matched and balanced across the seams wherever possible. The placement of the lines running parallel to seams have to be carefully pre-planned. If they sit close to the seam it will make he pattern look irregularly spaced; if they fall into the seam there will be a gap in the pattern repeat, which also will look odd. 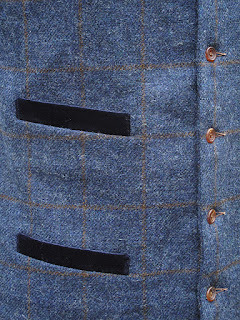 The cutting of the breast pocket welt is particularly critical. If you look closely I have matched the grid lines vertically AND horizontally, plus also ensuring that the welt has grid lines passing through it both ways. 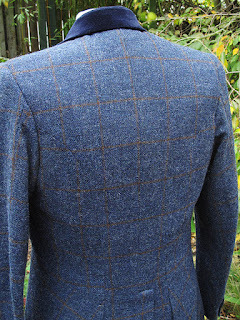 If the grid missed the welt it would look like a separate piece of blue fabric, disjointed form the rest of the coat. 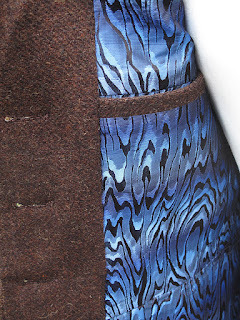 The waist seam at the front is carefully cut so the spacing of the horizontal lines is not interrupted or distorted. Obviously there are areas of the coat that cannot be 100% marched due to the shaping and fitting that darts and seams create, but these discrepancies have been concealed under the arm or towards the back out of sight. 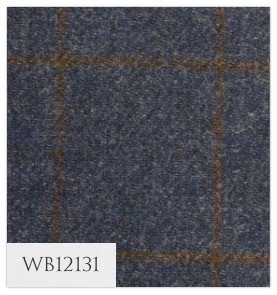 When he spotted the Shetland tweed on the W Bill website it showed a stock of 3.5 metres. 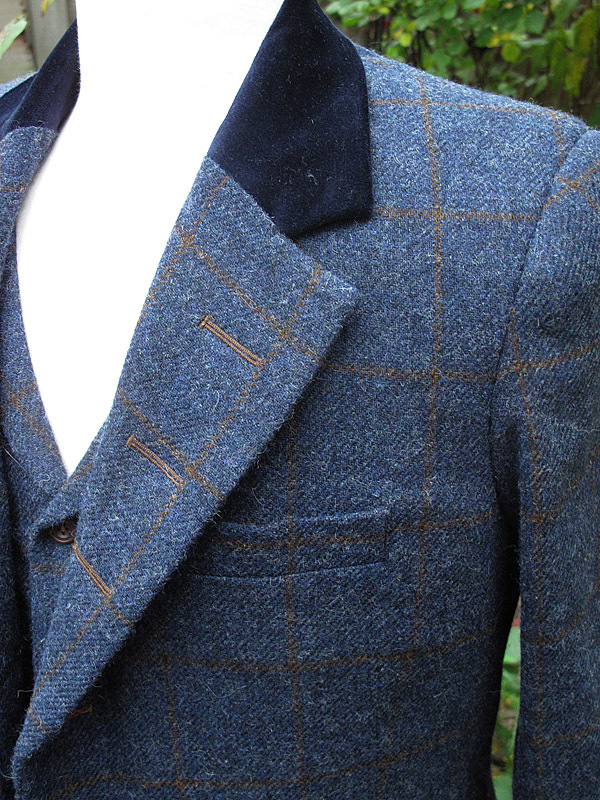 From my experience they are good at managing their stock, but before ordering I did get them to check that there was enough for me to make the coat. They came back to me saying there was a measured 3.4 metres, which I asked them to reserves while my client saw a in-hand swatch. 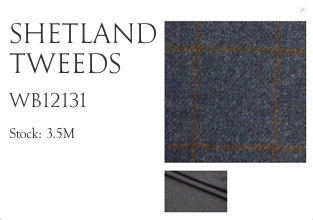 Once approved I called to order the tweed, only to discover that only 1.2 metres was left! 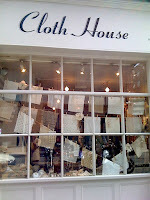 The cloth was already on re-order and due in within a couple of weeks, so luckily all was not lost. But through the inconvenience I get them to supply 4 metres for the cost of the 3.4 metres I was expecting to pay for. 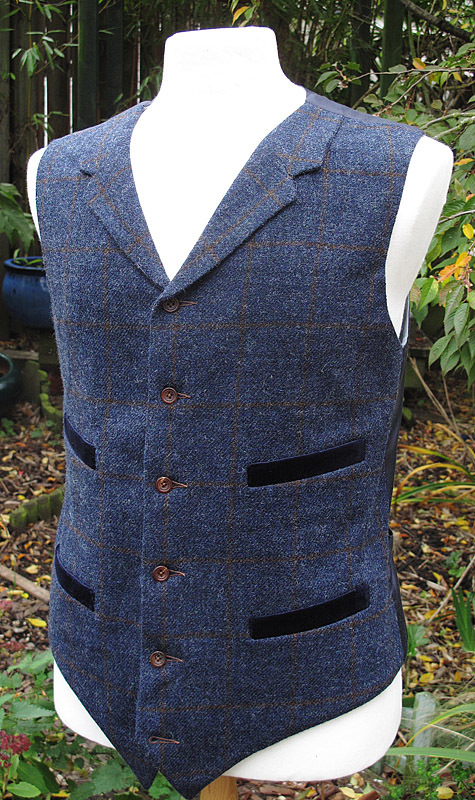 As a result, there was enough fabric left from cutting the coat so allow for me to make a matching a waistcoat - an opportunity my client jumped at. 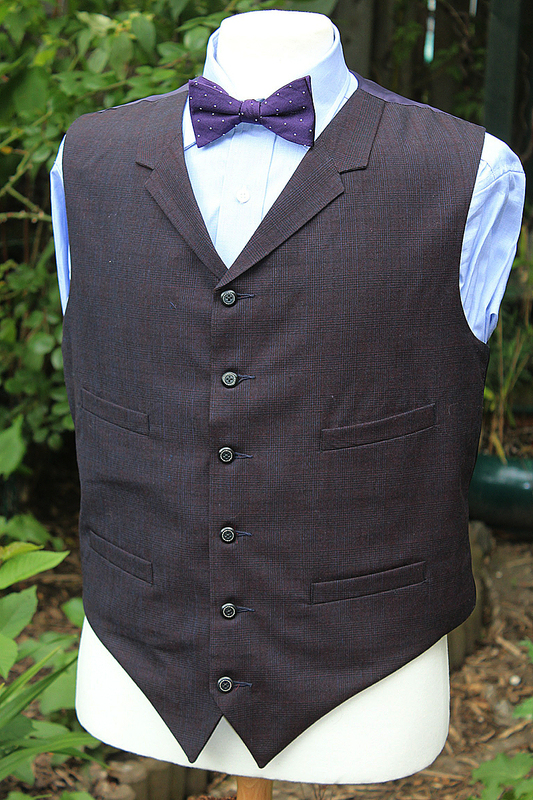 I used the same pattern as the Matt Smith waistcoat from Day Of The Doctor, which naturally goes with the frock coat. 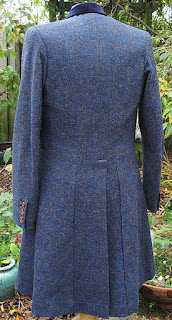 To tie the two garments together, I used the navy blue velvet from the coat's collar to make the welts for the pockets. 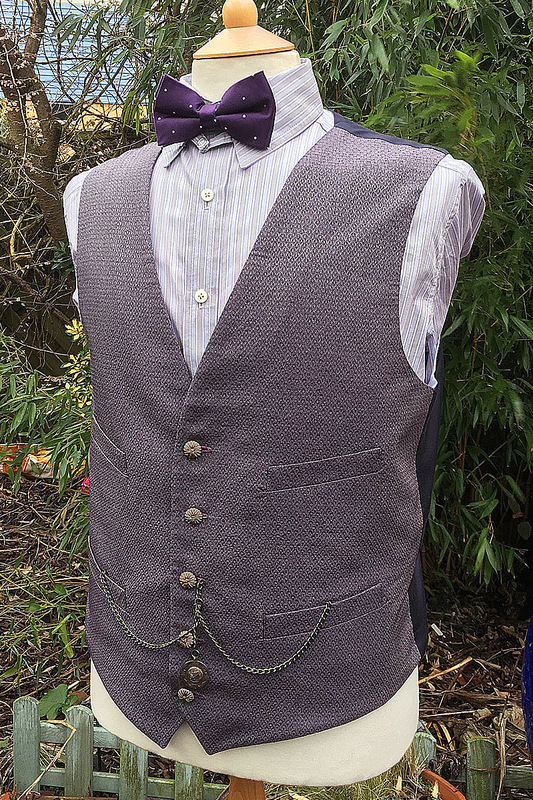 This made things a little easier for me, as I didn't need to pattern-match across the welts from the body of the waistcoat! 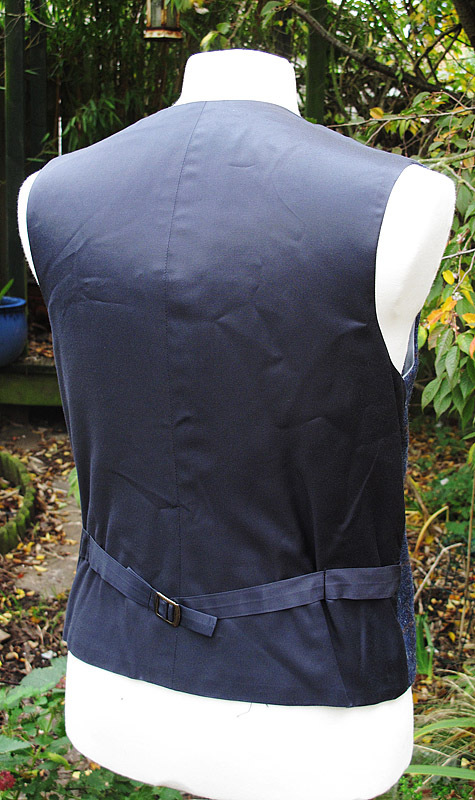 The back of the waistcoat uses the lining fabric from the coat. Being made from genuine W Bill Shetland Tweed, the coat has their special label inside. My own is concealed inside the pocket. 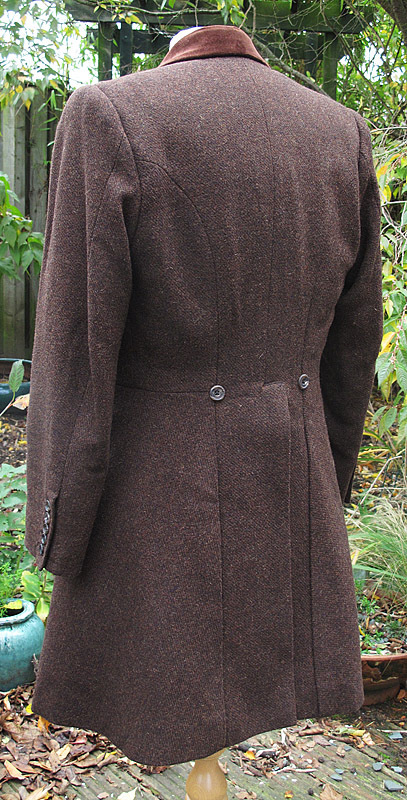 For this coat we stuck to the buttons and buttonhole configuration of the Matt Smith coat, though with the five-button cuff as I did on the brown coat. 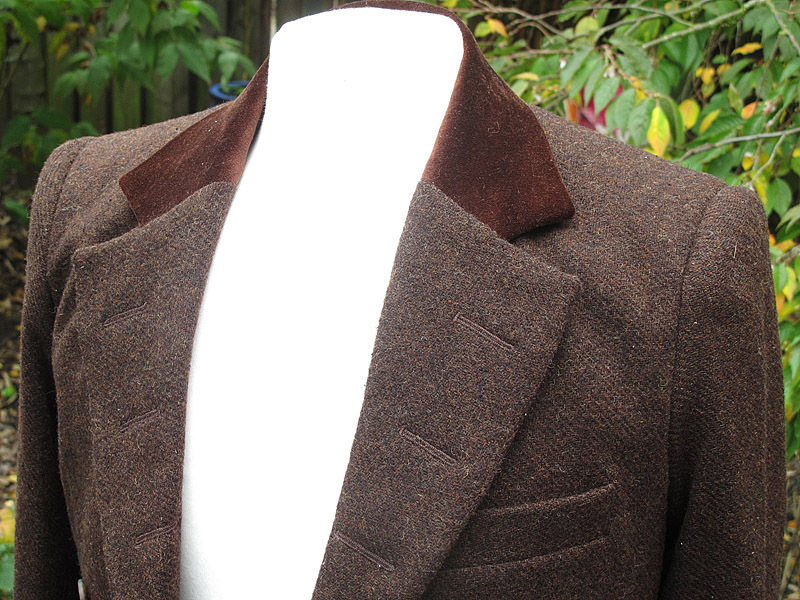 The same top quality brown horn buttons were used on the waistcoat. 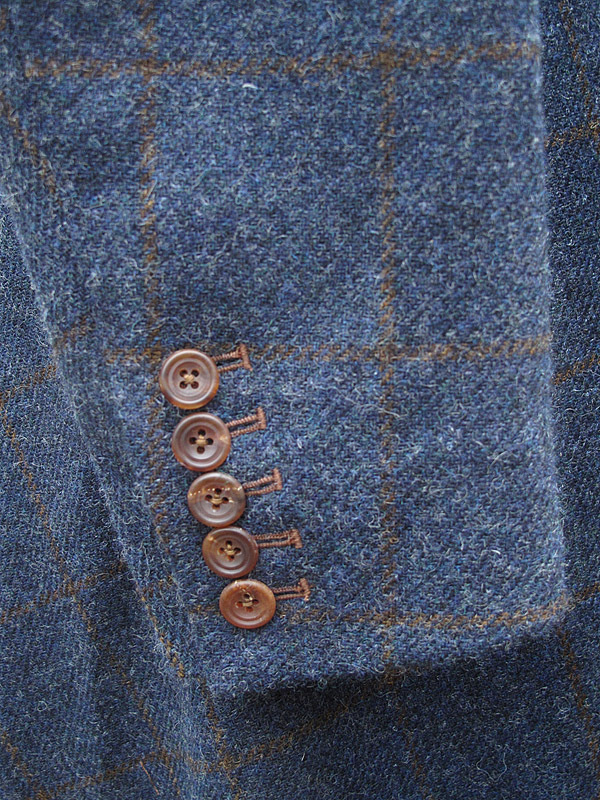 This picks out the colour of the grid, and the thread used for the buttonholes themselves match too. I must admit I wasn’t 100% sold on the choice of fabric to start with, but now it is all made up and together, I think it is a stunning outfit which I hope the client enjoys wearing. 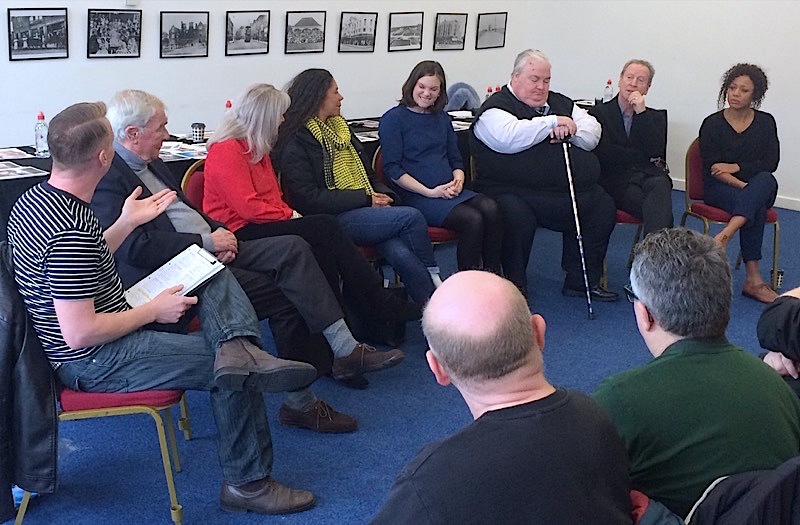 The final Barking signing event of 2015 was a late addition to the calendar, and brought together a handful of interesting guests. As I arrived I bumped into a couple of good friends, Chris and John, who I hadn’t seen for a while, so it was good to catch up with them before going in. The guest list wasn’t as full as previous events, but I did still need five autographs, so the buy-four-get-one-free policy was perfect for me. 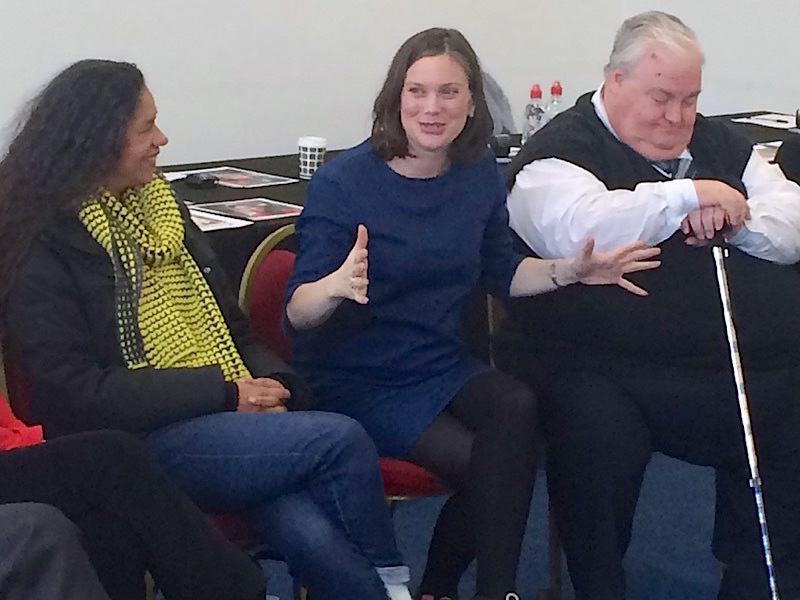 There was a predominance of Eleventh Doctor actors too, which we don’t usually see for some reason. 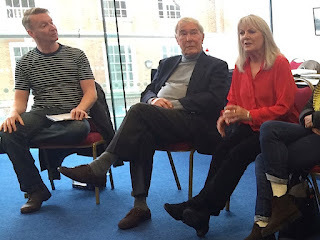 Tenth Planet Events are quite classic series biased - not that I am complaining! 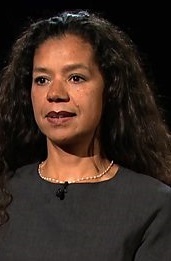 NINA TOUSSAINT-WHITE played Mels in Let’s Kill Hitler. I got her to start a new blank spread too, with a view to adding Alex Kingston when I get the chance. 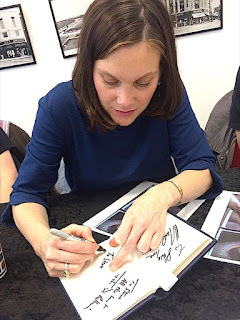 LIZ WHITE portrayed Alice the servant in The Snowmen. She also voiced Genestain The Brink of Death. Liz was on my hit list too. 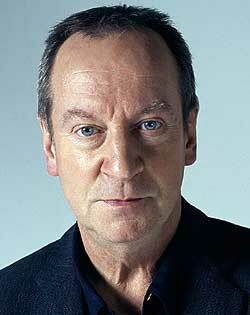 BILL PATERSON played Dr Edwin Bracewell in Victory of the Daleks and The Pandorica Opens. He has co-starred with many Doctor Who actors during a career. 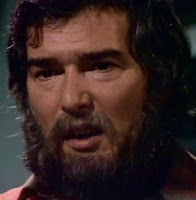 He was the lead character in Sea of Souls, which was produced by Phil Collinson immediately before his move to Doctor Who. 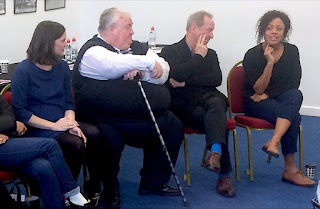 During the series he worked with many Who-related guest stars, including: Paul McGann, Michelle Collins, Colin Salmon, Michelle Duncan, Peter Guinness, Christina Cole, Peter Capaldi, Sarah Haynes, Nicholas Gecks, Ellie Haddington, Louis Mahoney, Michael Obiora, Eric Mason, Bhasker Patel and Struan Rodger. After Souls, he was the senior Crown Prosecutor in the first four series of Law and Order UK. He was thus the boss of Freema Agyeman's character — and eventually surrendered his wig to Peter Davison. Bill is someone I definitely wanted to meet. He's been appearing in series down the years with his distinctive Scottish accent, from Hitch-Hikers Guide To The Galaxy in 1978; through The Singing Detective; and the many documentaries and to adverts he's voiced since. 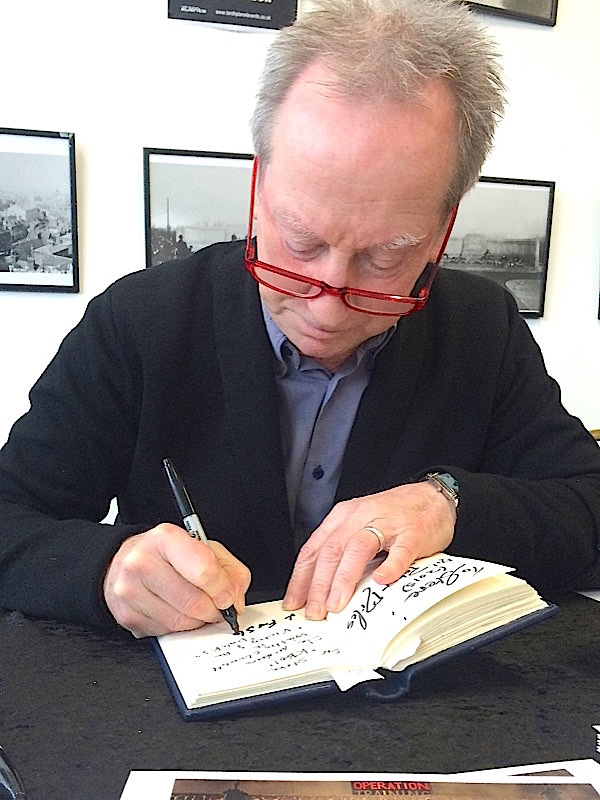 I'm greatly looking forward to his Fraiser in the upcoming Dad's Army movie due out early next year. I have simon in my book already, which is just as well since he is there today outside of the Tenth Planet Events guests, and is charging separately. Best of luck to him. 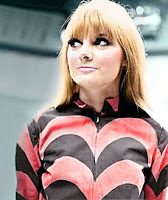 ANNEKE WILLS played the First and Second Doctor's companion Polly from The War Machines to The Faceless Ones. Anneke is a lovely lady, but I got her autograph at a previous event, so I don't need her today. 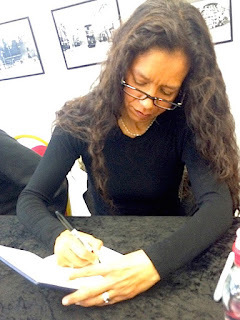 JAYE GRIFFITHS played Jac in The Magician's Apprentice and The Zygon Invasion, as well as a lead role in 1990s espionage drama Bugs. Jaye is one I need for my book, and I got her to sign a new blank spread so I can add Kate Lethbridge Stewart in due course. MICHAEL MCSTAY played Derek Moberley in The Seeds of Doom. I'm not over familiar with Michael as an actor, but with the fifth free autograph, I've got him too. Once everyone had their autographs it was time for the Q&A session. It kicked off with Liz Smith talking a lot about her time on Life On Mars. She recalled the attention to detail the producers went to for every aspect of the series. She said there were drawers in the police station containing index cards full of supposed crime info. None of it was seen, but it was there just in case it was needed. She also told us a hilarious story about dog poo! The producers had made fake poo - in white as that was what happen to it in the 1970s due to the additives in dog food at that time. I must admit it chimed a chord with me and they were right! She also remembered the ‘period’ costumes that had to be made, as true vintage clothes don’t really fit the figures of today. Turning to Bill Paterson, it quickly emerged this was his first EVER event appearance for anything he had done, so it was a bit of a coup getting him. 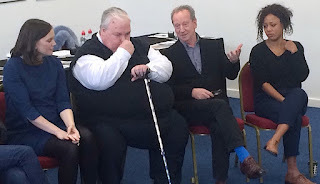 As well as talking a little about Doctor Who, he spoke about his up-coming appearance as Fraser in the Dad’s Army film. He said it was over a year since they had shot it, but the producers were waiting until February to release it as similar films with elderly casts perform better if released during the first three months of a year! 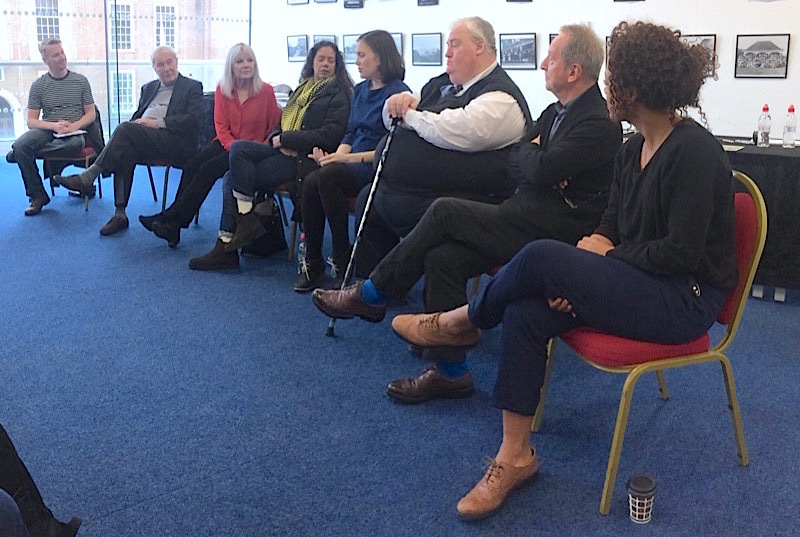 Nina Toussaint-White recalled her first big break, working on EastEnders and seeing the Albert Square at Elstree Studios, a stones throw from where I live. She said although it has quite a big cast, it was quite a lonely experience to work on as she only ever got to meet and interact with a limited number of the cast, mainly those playing her close family. 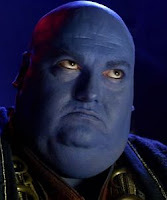 Simon Fisher-Becker is well known for being a big Doctor Who fan, but he said this was affirmed when he was first on set and seeing the TARDIS. This made him even more of fan rather than a follower. Jaye Grifffiths was someone I wanted to hear from, but was desperately disappointed with her comments and recollections. For her acting is just a job and nothing more. It is all about the next job, rather than endlessly looking back at the last. She described acting as more about the people you work with and how you bounce off them rather than the work itself. This meant her memories of programmes she has worked on are all impressions rather than recollections of specific happenings. Talking of Doctor Who, she said she was totally unaware of UNIT and the place it holds in the folklore of the series. 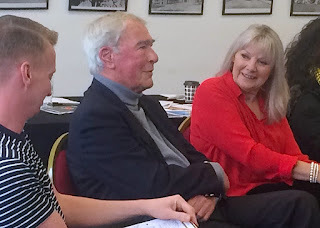 She did say working with Gemma Redgrave was enormous fun, as was being chased by aliens and commanding UNIT personnel with their big guns! Addressing the whole line-up, they were asked what had been their worst location shoot. Jaye’s was undoubtedly having to be in the Thames for Bugs. It was freezing cold and filthy but the only footage used was a tight close-up, so she could as well have been in a warm bath rather than a stinking river! 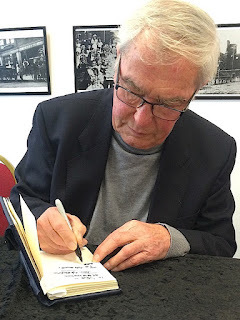 Michael McStay remembered having to film on a rubbish tip close to Heathrow airport, and Bill’s worst was the heat of Karachi for the Channel 4 series, Traffic. 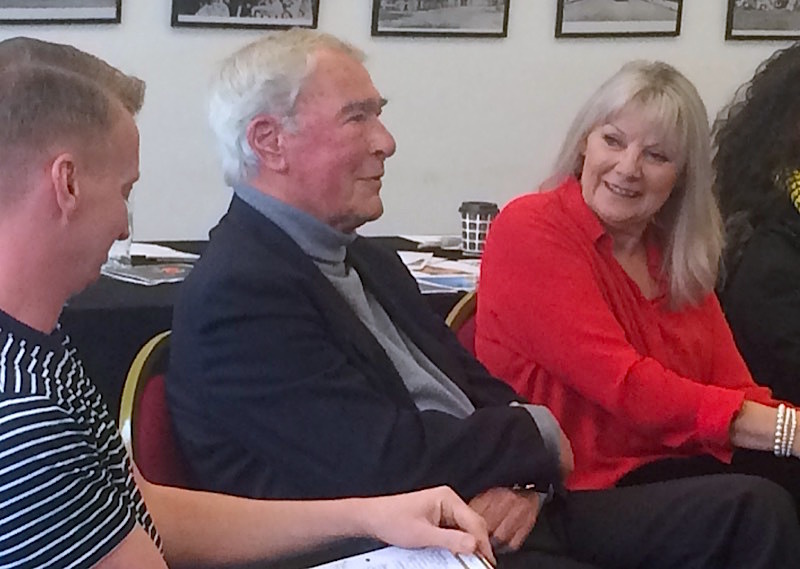 Anneka Wills, vertically, remembered the studio-based tank filming for The Underwater Menace, which has recently been released on DVD. She then had the nerve to say what I am sure a lot of us have been thinking, that The Underwater Menace is really just a load of rubbish. She went on to say the release itself wasn’t the best and felt quite rushed and incomplete. I have to say I do agree with her. Pity it wasn’t one of the Patrick Troughton Dalek stories that had been re-discovered. 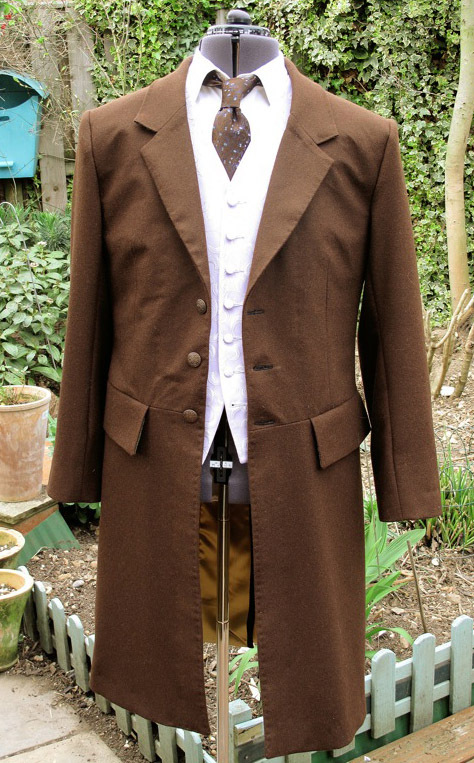 This is the first of the two finished custom frock coats I have made this month. 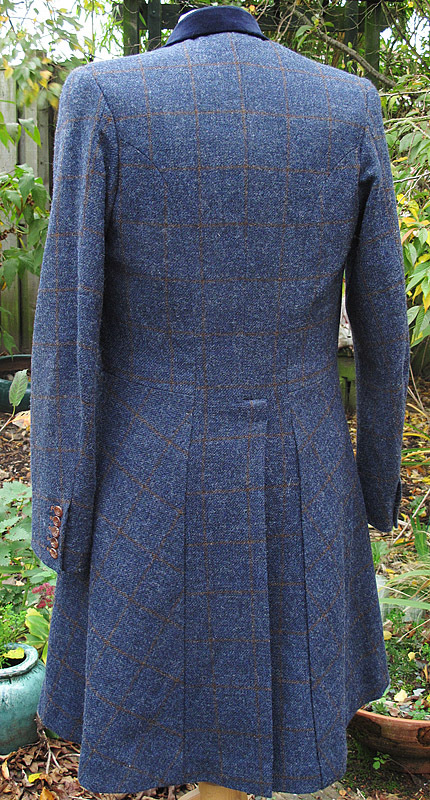 We have used the very same pattern as the Matt Smith frock coat, keep ing the lines nice and clean, but with a couple of twists here and there. 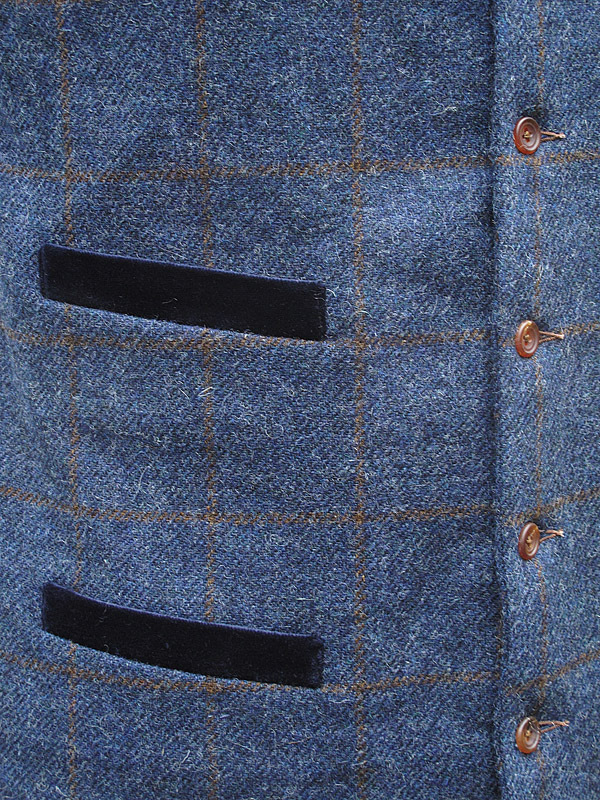 The Matt Smith coat has an unusual arrangement of buttonholes: there are three either side at the front, as if to button the coat up - but with no buttons opposite to match up. In fact, the arrangement of three on BOTH sides would suggest a double-breasting, but the coat is simply not cut for that. So I have added buttons, in a double-breasted style. 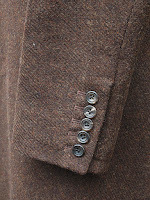 Matt’s coat also has an array of lapel buttonholes - three on either side too. 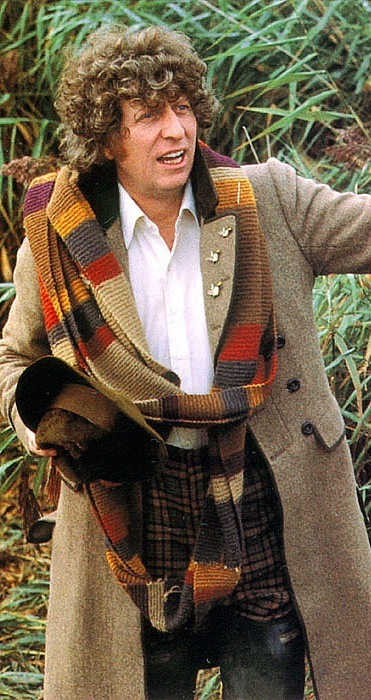 This arrangement apes the season 16 coat first worn by Tom Baker in the Power Of Kroll, and by adding the buttons it is a further nod to that coat too. 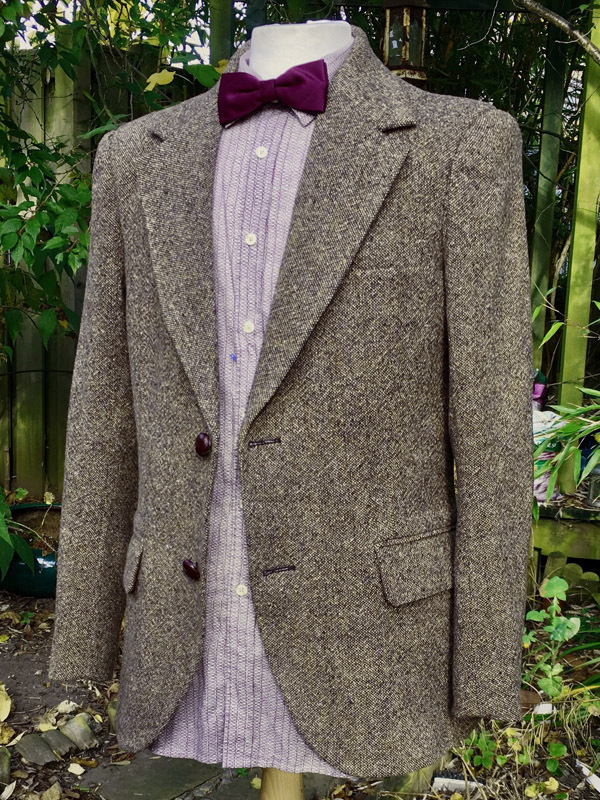 The Matt Smith coat has a corduroy collar in a deep purple. For this coat I used the very same chocolate brown velvet I used to make my Tom Baker coat. 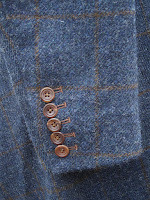 As we have included buttons on the front, it goes to follow that buttons are added to the back too. 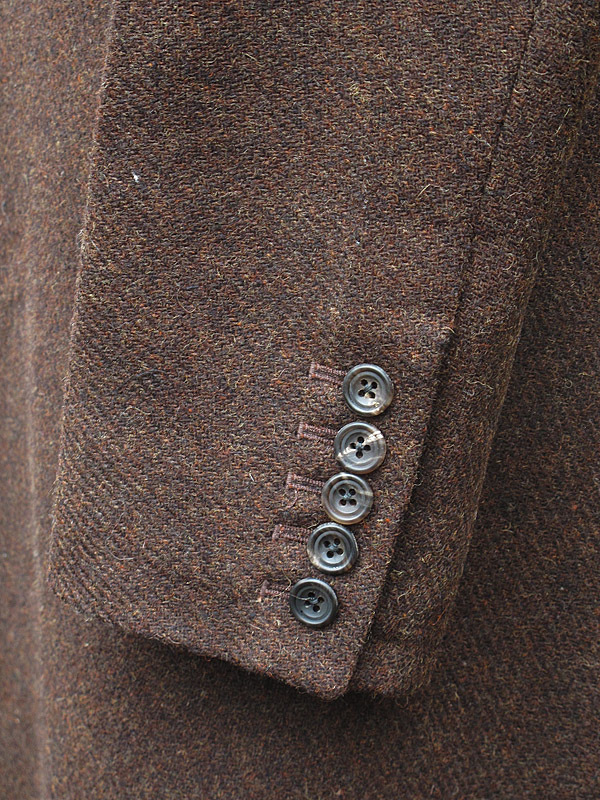 Finally, the I have made the cuffs with five buttons. 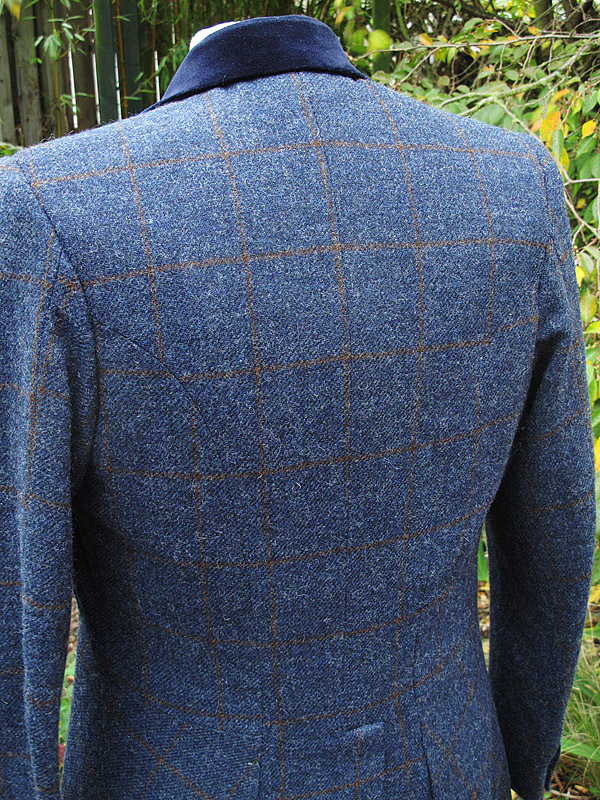 I noticed that each coat Matt wore had one more than before - the Donegal has two; the Shetland has three; the cashmere has four - so I have made this the next in line with five. But the big secret about the coat is the lining. For this I have used something very special and unique. It is a blue colourway of the stunning red-flame lining used in the Ultimate Sixth Doctor Frock Coat. This is the first time I have used this cloth, so it makes the finishing something a little eye catching. 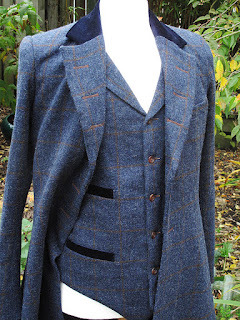 Once in a while, amongst all the tweed jackets, Crombie coats and knitted waistcoats, I get the occasional commission that piques my interest and gives me the chance to be a bit more creative than usual. 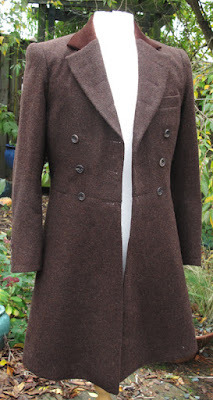 I have already made one or two frock coats to patterns I use, but using cloth at the choice of the client, and these have inspired my latest commissions. 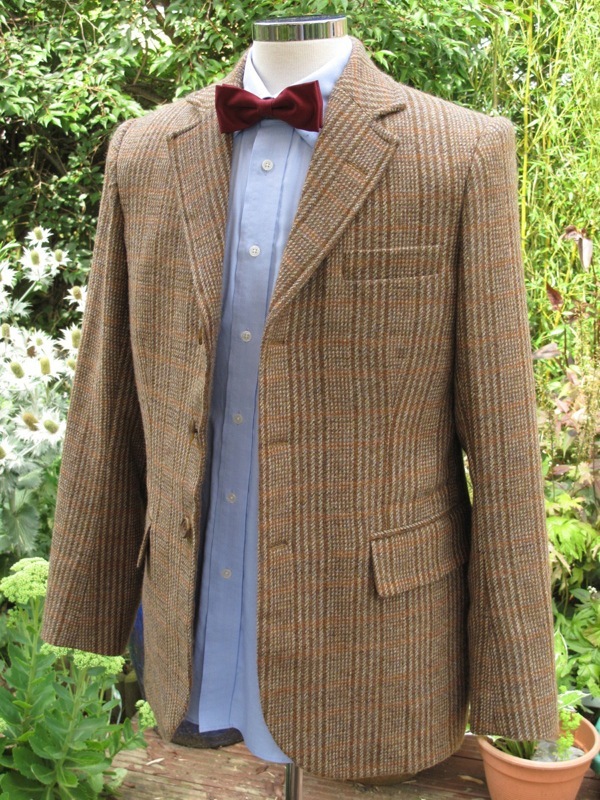 Since series 7b, the stylish lines of a simple frock coat have become very popular. Barely a month goes by without me getting one or two requests for a cashmere coat. If it wasn't for the lack of available fabric I'd be making it more often! But this month had not one, but two serious enquires for Matt Smith style frock coat, each in starkly different tweed fabrics. By contrast, one client is in the UK, the other in the US. Both were attacked by those simple lines, lack of outer pockets, and the fitted drape of a more thoughtfully cut garment. 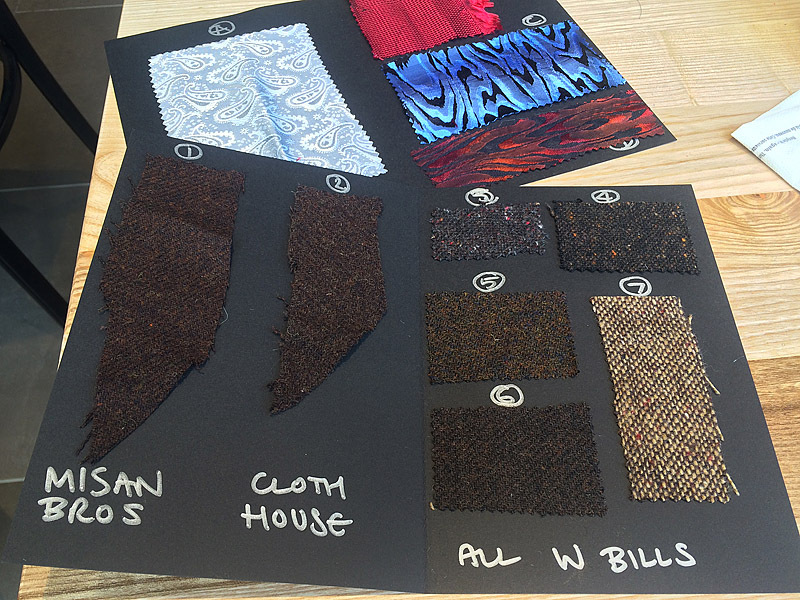 My UK-based client wants his in a dark brown tweed - something with some texture and visual movement to it. 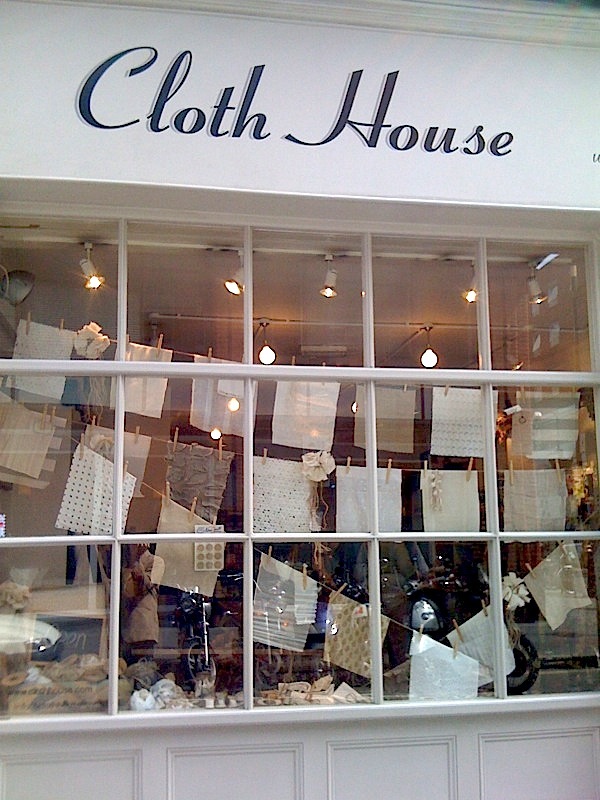 He has left it totally up to me to source the cloth so I sent him a choice of swatches from W Bills and a number of quality cloth houses in London's Soho. 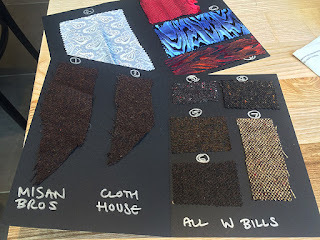 He's gave me a brief for the lining, which I have already found a perfect match for - a jacquard weave in a silver paisley design but to make the coat a little bit special I also included some of the custom woven linings I have in stock. Ultimately it was one of these he went for - I’ll keep it a surprise as to which. My US-based client on the other hand has seen a very specific Shetland tweed from W Bills, and wants me to use that. 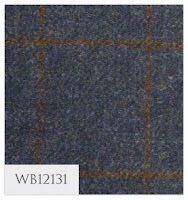 Before you jump to conclusions, it is not the Shetland tweed used to make Matt Smith’s jacket, but a dark steely-blue with a bold brown grid pattern. 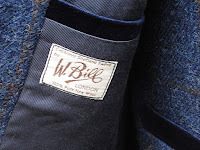 Sourcing the tweed from W Bills was easy for me, as I have contacts within the company. This way I was able to reserve the remaining 3.5 metres (just enough to make the frock coat) while I sent a swatch the US for approval. For his lining he found a fabric in the US which he sent over to me to use. 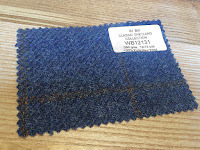 Unfortunately this proved to be unstable for lining the coat, so I sourced a very nice quality blue twill fabric. 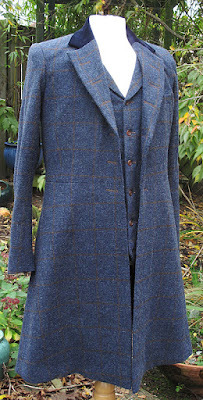 Getting the cloth for the other coat was a little more tricky as the choice ended up being from one of the Soho fabric shops, which tend to only get one-off bolts which once gone cannot be restocked. With this in mind I was instructed to buy additional material to cover either a second coat or a pair of trousers and a waistcoat. Luckily there was enough to cover everything my client wants, so that was a relief. Once I had all the fabric I needed, I turned attention to cutting and making-up. Check back very soon to see how these two coats turned out. This unusual item turned up on eBay this month, being auction for charity. This is a very rare item, a genuine TARDIS door sign, used during the filming of Series 5 of Doctor Who, the first to feature Matt Smith as the Doctor. The sign, having been used for filming was damaged en route to a filming location and was then replaced. The damage is apparent. One corner has broken off altogether (although is present and has been reattached by plastic film applied to the rear of the sign). Some of the letters have also come adrift and are missing. The photographs show the worst of the damage. The discarded sign was rescued by Tristan Peatfield, who worked as Stand-by Art Director and then Production Designer on that series (between the departure of Ed Thomas and the arrival of Michael Pickwoad). 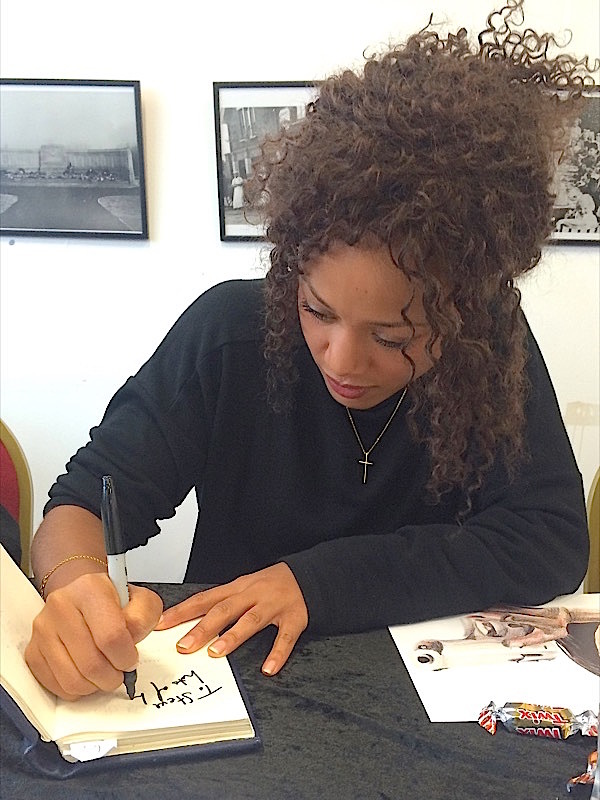 I am selling it on Tristan's behalf, in aid of the charity that he and his partner Kim established in the name of their daughter Isabella, who was the youngest British victim of the 2004 Indian Ocean Tsunami disaster. 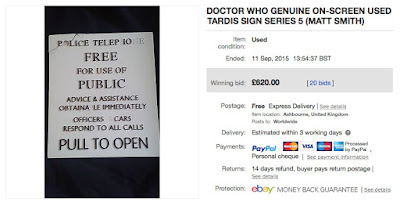 Q: I would like to know if there will be a Certificate of Authenticity (COA) or some other documentation illustrating the authenticity and history of the "DOCTOR WHO GENUINE ON-SCREEN USED TARDIS SIGN SERIES 5 (MATT SMITH) included with the item? Thank you. A: I can arrange for this if needed. Q: Hello, I was curious, do you know what episodes, specifically, this sign was seen in or could have been seen in? I understand it was Series 5, Matt Smith's first season, and with the range of assistants you listed it could have been anything before the Christmas special, but I was wondering if you could help me narrow that down. If not, that is perfectly fine. 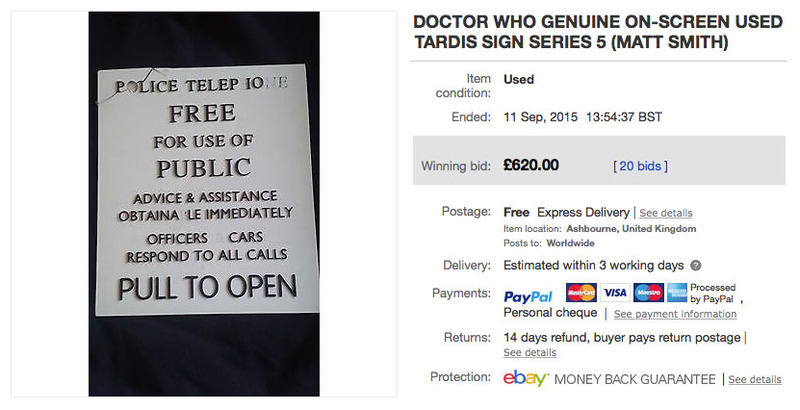 It's a wonderful item either way, but I was considering bidding on it as a gift for someone and it would be better if I could at least give an episode, a range of episodes, or say "this is the sign from most of Series 5" if that is indeed the case. Thank you. A: Hi, I have asked Tristan this very question, but I'm afraid he just doesn't remember. It will have been earlier rather than later in Series 5, I believe.